Shikokuhuuro is kind of Geranium; what we call “Hurosou: Geraniales” living in the large area of the Japanese mountain. It is also called in Japanese “Iyohuuro”. “Iyo” is old name of Ehime prefecture, and is a kind of district in Shikoku. These plant’s scientific name is Geranium shikokianum. Many species of Geranium have some distinction, mainly 10 to 20 cm height, has 1 pistil, 10 stamens of inside which 5 stamens are longer than other 5 stamens on the outside, and 5 petals which are white to red or violet, but the shapes are different between species or even within the same species at times. There are also some species, Hakusanhuuro(G. yesoense) or Bittyuuhuuro(G. yoshinoi) etc., similar to G. shikokianum’s petals which have pale violet and deep lines, so their identification is very difficult. There are more than 420 species including many garden plants of Geranium around the world. The garden plants are called “Geranium” from the genus name, but it includes many Pelargonium species which are the same Geraniaceae. Why do we call it this? Actually, Pelargonium was once regard as Geranium, so, after the revision, garden plants of Geranium and Pelargonium are called “Geranium” as there are. In Japan, there are about 10 Geranium species including G. shikokianum distributes in sunny mountain. In Kochi, G. shikokianum live in Thurugi Mountain or Ishizuthi Mountain etc. mainly in Shikoku mountain district. But, contrary to the name, it distributes wider than the Shikoku district, in western part of Japan than Toukai district, for example, it is description on the red data book in some areas of Kyusyu, Chugoku and Kinki district. 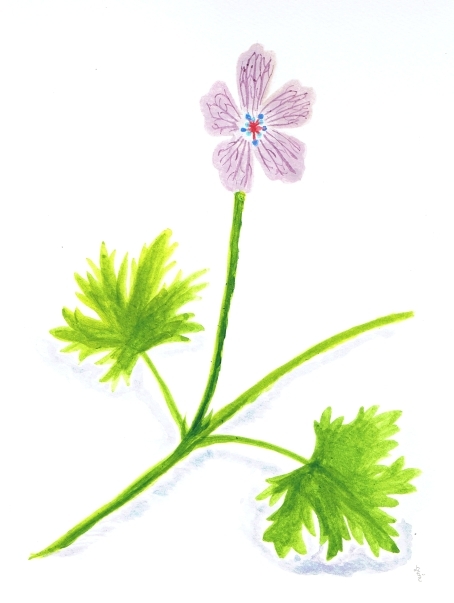 Geranium has much tannin which is generic name of astringent taste ingredient included in edible plants such as the green tea or persimmons, has effect of gastrointestinal medicine like binding medicine. So, Geranium distributes in Japan, Kohuuro(G. tripartitum), Himehuuro(G. robertianum), Tathihuuro(G. krameri), Gennosyouko(G. thunbergii) etc. and Shikokuhuuro(G. shikokianum) too, has been utilized as a herbal medicine from a long time ago. The medicine is called “Gensou”, and is widely utilized in a Japanese folk medicine. G. thunbergii especially distributes in wide near areas of human habitation, so it has used for very various illness. Since, the species is called “Gennosyouko” which the mean is “the effect surely appears at once”. It is doubtful, it may be drunk for so many illness that there is a talk that it even work for a headache. G. shikokianum likes sunny grassland on high altitude mountain, but sometimes flourish on forest areas. The pretty flower, comparatively larger than other Geranium, is pollinated by bee and other insects able to fly. It forms small colony, and become small flower bed in the flower season, from summer to early autumn. Therefore, from spring, you can see it in only leaf state, had deep notch like hand shape. But the shape is so likely a mugwort or an aconite that you probably couldn’t identify G. shikokiakum. If you want to see the flower in Kochi, you should climb Tsurugi Mountain or Ishizuchi Mountain in the middle of July to the early September. Climate near the top is very cool even in summer, so you will have a good time.